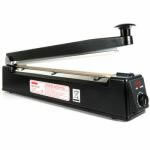 High quality heat sealers to suit the needs of any business, from industrial heat sealers, to table top heat sealers with cutters to hand held heat sealers for poly bags for cold food such as sandwiches, meats and cheese. We are packaging experts and are here to help. If you are considering purchasing heat sealers for packaging purposes but are unsure which heat sealer machine is right for you, check out our website. Heat sealers (also known as bag sealers) are used to seal polythene and plastics and are available in a range of different sizes. The sealers are ideal for use on plastic tubing as they close off the edges, ensuring that it protects the content inside. Used with layflat tubing means you can customise your bag sizes. The basic heat sealer that we sell is available in three different sizes and has been designed to work on a variety of films. Our models of bag sealers work by being electronically controlled. The heavy duty plastic bag sealer is fitted with an electronic timer that maintains the consistent level of sealing. Once the controls have been automatically set, the seals on the bag sealers will open and shut consistently.